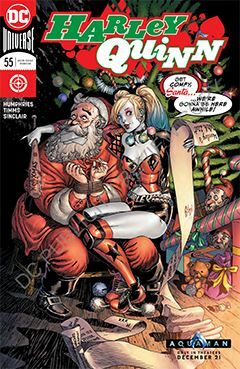 I guess Harley Quinn wasn’t invited to the usual DC Christmas With the Super-Heroes, so her title featured her own holiday hootenanny. It surprises me that Harley celebrates Christmas, as I always assumed (perhaps unfairly) that she was Jewish. Blame it on the New York accent. The Quinn’s are in town – the ‘rents and three brothers, all of whom have their own issues that shed insight into Harley’s own mental instabilities. But it’s a bittersweet reunion, as a yuletide tragedy strikes the Quinn family – and we aint talking about a ruined holiday dinner, though that is part of the menu. But this is merely a brief interlude before greater things, as the story ends with the return of a beloved DC character – assuming it’s who it looks like to me (I haven’t kept up with recent costume changes). The next few issues promise “cat-astrophic calamity” followed by a “bat-tastic team-up.” Draw your own conclusions as to what that means.